Realme C1 is launched in September 2018. Let's find out its specification and performance. Oppo subbrand Realme doing a great job in India. The recent Realme 2 Pro ₹ 13,990 smartphone offered very good all-around performance and good value and now the company launch Realme C1. It has powerful Qualcomm Snapdragon 450 chipset, big display, and a massive battery. 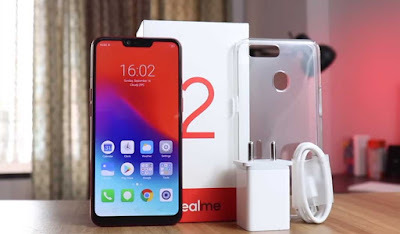 Should you buy Realme C1, let's find out. Realme C1 body made by the plastic and it makes the device very light. The matte finish of the frame doesn't have fingerprints scanner but you will get the face unlocking system. The display uses Corning Gorilla Glass which protect the phone, that's pretty nice. The Realme C1 has a massive 6.2-inch HD+ display and the color saturation is good. Realme C1 have single SIM tray on the side, which can accommodate two Nano-SIM cards and a microSD card (supported up to 256GB). The speaker grille, Micro-USB port, and 3.5mm headphone jack are on the bottom. In the back get dual rear camera setup on the top and a single LED flash, and the Realme logo at the bottom. In the box, we get a silicone case, a SIM ejector tool, user manuals, a 5W adapter, a screen protector, and a Micro-USB data cable. The Realme C1 have Qualcomm Snapdragon 450 chipset, which running speeds of up to 1.8GHz and the GPU is Adreno 509. The benchmarks performance is good compared to another smartphone in this price range like Redmi 6A. The RAM you will get is 2GB and have 16GB internal storage but the available storage you will get is 8.67GB. The Realme C1 UI is ColourOS 5.1, which is based on Android 8.1 Oreo. Realme C1 has a 13-megapixel main camera with a 2-megapixel depth sensor and has a 5-megapixel front camera. The dual rear camera capture the portrait shots and the edge detection is decent, it's a pretty nice camera. In daylight, the Realme C1 captures a decent amount of detail in distant objects but in low light performed not very well. Video recording at 1080p but the output isn't very sharp, and there's no electronic stabilization like EIS and OIS. Also read: Realme 2 Pro: How Makes It A Great Budget Smart Phone? The battery in the Realme C1 is very large. In the smartphone get 4,230mAh non-removable battery, which is great. So, with normal use, the phone gives you almost 1-day battery backup. The Realme C1 does not support the fast charging and you get a 5W adapter in the box. In the Flipkart, the Realme C1 price is Rs 6,999 only. The specification of Realme C1 is good, in this price range. You will get massive 4230mAh battery and the Snapdragon 450 processor. That specification makes Realme C1 is a great budget smartphone. If you looking for a smartphone at this price then you must purchase it. Now, please comment us, which specification of this phone you like most. If you like the articles then share with your friends also follow us on Twitter. Thanks to visiting our website.